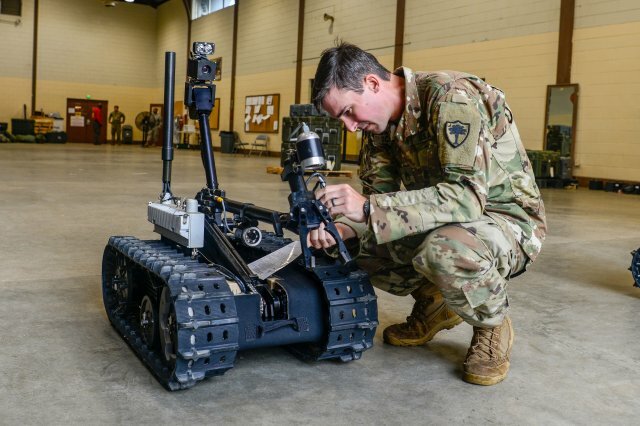 FEBRUARY 7, 2019, Arlington, VA – The use of robots continues to grow within the National Guard and Guard members are likely to soon see additional robots with expanded capabilities, said an Army National Guard acquisitions official. 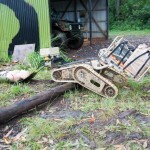 Robots are currently used for a number of mission sets including engineering, explosive ordnance disposal, reconnaissance and detection of chemical and biological agents. Future robots will expand on the capabilities of the current Talon series of robots, as well as take on additional, more generalized functions within a unit, said Bryan McVeigh, the project manager in the Force Projection section for the U.S. Army’s Program Executive Office for Combat Support and Combat Service Support. Those robots range from small, 25-pound robots to large-scale versions capable of carrying more than 1,000 pounds. “As we look at robots today, you basically have four different sizes of robots that are being fielded either today or within the next 12 to 15 months,” said McVeigh. The smallest is the Common Robotic System — Individual, used to clear buildings or confined areas, identify enemy positions and scout for explosive hazards. Weighing in at 25 pounds, the new iteration is smaller and lighter than current versions. At the opposite end of the scale is the Squad Multi-purpose Equipment Transport, or SMET. 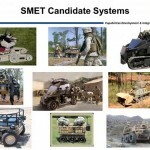 Still under testing and development, the final version of the SMET may also have a remotely operated weapons system mounted to it. “We currently don’t have that requirement, but we are working on demonstrations,” said McVeigh. The technology for that already exists in the Common Remotely Operated Weapon Station, which allows vehicle crews to operate machine guns and other weapons from inside the vehicle, rather than an exposed turret position. The question, said McVeigh, is what distance the operator needs to be from the SMET when the weapons are used. 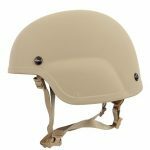 McVeigh acknowledged that distance isn’t always possible, or practical, on the battlefield, adding that in reality the greater likelihood is the SMET operator, and other squad members, would be in a nearby covered or concealed position using the SMET to provide suppressive fire. “I think we’re going to have to work on the tactics, techniques and procedures and the safety constraints we’re going to have to do to build a level of confidence in it,” he said. The new series of robots are designed to have integrated controllers running from a common application-based system. A common app system also allows an easy way to adapt to future control function needs, he said. Having that common controller and app system also makes for easier mission planning, he said. “If all the robots have a common controller and you basically understand their functionality, then it’s easier to write an [operations] order because you understand how the systems interface with each other, how they hand off to each other and go forward,” said McVeigh. Up until now, the controller and the operating system have been specific to each robot series, said McVeigh. While the current and near-future robot designs all require a human operator, other systems are in development that allow for more autonomous operations, including one designed for route clearance. Currently, engineers running many route clearance missions use the High Mobility Engineer Excavator (HMEE) — essentially an armored backhoe — to dig out and neutralize roadside bombs. The excavator is driven by a Soldier, often in convoy with other route clearance vehicles, such as the Buffalo mine resistant ambush protected vehicle. “Once you identify an [explosive device] the Soldier drives the HMEE up to where the [device] has been identified and uses the backhoe to dig it out,” said McVeigh. Future systems may automate excavation of the explosive device. “There are some semi-autonomous commands that you can press a button and the system does those things automatically,” said McVeigh, adding that Soldiers still need to drive the excavator and then dismount before it’s sent forward to dig out the explosive device. 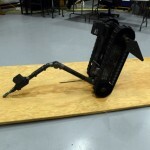 Other items are under development that would eliminate the Soldier from the excavator entirely. “It [would have] a leader-follower capability that allows the HMEE to remain unmanned while it’s moving in convoy and it, basically, just follows where the Buffalo leads it,” said McVeigh. The excavator’s operator would, instead, be able to operate it from inside the Buffalo. A similar leader-follower system is also under development for the Heavy Expanded Mobility Tactical Truck, specifically the Palletized Load System variants that allow for quick on and offloading of containerized loads. The leader-follower system allows for up to seven PLS trucks to autonomously follow one truck driven by Soldiers. “That’s going through a demonstration and test this year and will go out for a yearlong demonstration with two different transportation companies to get user feedback on it,” said McVeigh. The two systems are helping to lay the groundwork for future combat vehicles. “Both of these two systems are providing us with fundamental information on autonomy and sensors integration that are absolutely critical to moving forward with a robotic combat vehicle,” said McVeigh. However, any combat vehicle or weapons system would have human overseers, he said. 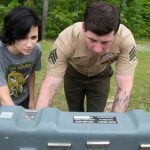 “There is always going to be a [person] in the loop before the trigger is pulled,” said McVeigh, adding that the greater focus on robotics will, ultimately, save Soldier’s lives in combat. McVeigh said while some of the developments may seem like science fiction, they’re closer to reality than many may think.